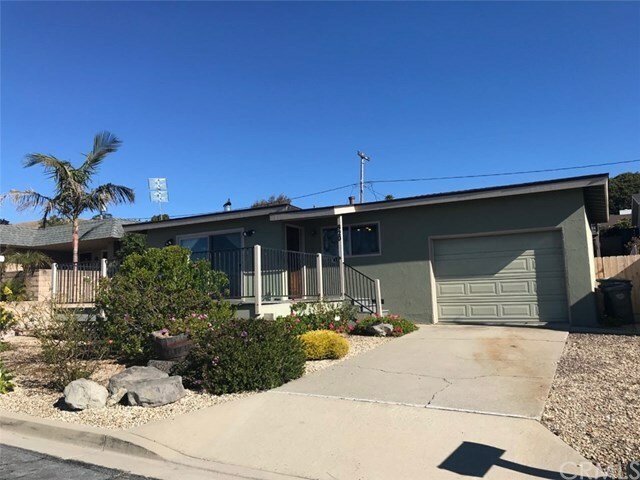 Single level charming beach cottage with spacious Trex deck out front with some ocean, dune, and city views. Some amenities include a 2yr.old roof, new R/O system, tank less water heater, a new fence on one side of the home, and a new beautiful front door. There are orignial hardwood floors in the living room, hall and the two bedrooms. The living room opens to a spacious Trex deck and has some views of the ocean and the city lights. The big back yard is nicely landscaped with a vegetable garden, patio, Santa Maria style brick BBQ, and a raised shed perfect for lawn equipment, art room, etc. This is a very well kept and lovely home ready for it's next owners! There are approved plans to exspand the kitchen/dining area, remodel the kitchen, remodel the bath room, extend the master bedroom and add a master bath, and add a back door to the laundry room so you can access the backyard. Directions: Up Longview, left on Visalia, home on right side.